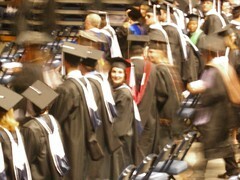 Yes, that’s me in cap and gown. The weekend was a blur and I’m already trying to see ahead to what comes next now that graduate school is over. I promised to share some of the insights that whole four year process generated in me. I’m still sifting and sorting through the various impressions and thoughts that keep bubbling up as I go about my days. One thing that is abundantly clear: keeping a basement organized and neat while homeschooling, running a business and going to grad school is impossible. There are others, too, though. The subtler ones. It’s important to read, to think, to spend time with an idea. It’s equally important to have someone critique your thinking, to provide you with insight into how you think, to offer you alternatives to the ideas you naturally conclude. As home educators, we’ve often majored on the importance of reading as the key to self-education. I’m a believer. I’ve been to the church, recited the creed and shouted the ‘amens’ to that sermon. Graduate school reminded me, though, that sometimes we can’t see our own thinking until someone else helps us to look at it again. Sometimes reading alone means staying stuck in a habit of thought or belief that deserves to be challenged. There is power in having a companion (a knowledgeable companion) act as counter-point. It’s valuable to come to a well-prepared lesson by someone for whom the topic is her passion as well as her area of expertise. So when I apply that insight to my own home, I find myself looking for ways to put my kids in contact with those who would offer them another way of seeing, passion for the subject area and whose leadership will challenge them to think more deeply than they could on their own. At Brave Writer, we offer online classes and literature/movie discussion groups with that idea in mind – giving you and/or your kids someone to act as counterpoint, as knowledgeable companion who prepares lessons for your enjoyment and growth. We’ve made use of local public school’s part time enrollment option in high school, the zoo academy classes for junior high kids, library book groups, math and music tutors, co-op courses, and literature discussion groups in our home. If you are worn out wondering how you can be all things to your kids in their home education, take a tip from me. Don’t be. Find those opportunities that allow your children to be both inspired and challenged to grow at a whole new level. You’ll grow along with them, too. Please post the kinds of ways you’ve given your children a chance to learn from others in the comments section of this entry. I recently read a biography about Jefferson, “Man on a Mountain,” that described his journey to becoming a deep-thinking genius. That journey was based on interactions with a series of mentors and friends. The letters Jefferson sent and received numbered in the 1,000’s. Self-teaching and quantities of reading were the hill that I stood on for so long in our homeschool, but I now see that our children were so often stuck in a certain way of thinking, as you described it, instead of growing and expanding. The discussion level in our home has gone way up, and even though it is a struggle in terms of time, I try to read some of the books that our children are reading for homeschool, so I can bring my perspective to the table. They may be going through less in terms of quantity, but I see more learning and enjoyment. And of course, Bravewriter classes and discussion groups were the beginning of my changed perspective. Our oldest son grew more from his lit discussion group with Jon and his Bravewriter classes than almost anything else during his last two years of homeschool. Julie, we really want to send huge contratulations to you on your graduation! What an incredible feat, to home-school some children, oversee another through part-time high school, and shepherd yet another through the first steps of university life! And I thought my life was busy! I do hope you have a well-earned holiday planned, so your whole being can relax into a satisfied state of “ahhh” for at least a period of time! Thank you so much Anna. I love your family too. It feels great to have all of you cheering me on and sharing your families with me. It’s an honor and privilege.